The problem with playing complex games on mobile phones is that touch screens are not really designed to offer enough control within the game. The new Moga Mobile gaming controller makes playing games on your smartphone even more enjoyable. 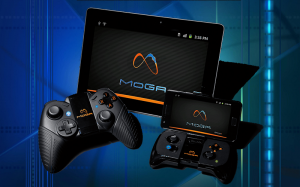 However, now that problem has been solved thanks to the Moga Mobile Gaming Controller for Android. The device which runs on AAA batteries looks very similar to an Xbox 360 controller. It is very light and comfortable to hold. Smartphones are attached to it thanks to an extendable arm which flips open. The controller itself has two joysticks, four face buttons and Start and Select buttons. There are also two triggers on the back. It is extremely easy to attach to any smartphone and thanks to the Moga Pivot app synching it with your device takes no time at all. The app will also tell you which games are compatible with the controller. Best of all, the device will even fit into your pocket so your phone remains a viable mobile gaming device. The device offers a huge step up from touch screen controls and will make a huge difference to any kind of game, from racing to casino. There are also plan to release a model suitable for use with tablets.